How do I create folders to organize my forms? And then how do I move existing forms into those folders? Is it Drag and Drop? 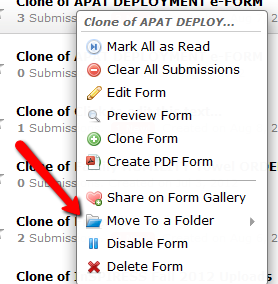 After you have successfully created a folder, you simply need to right click on the form that you want moved and select Move to a Folder > Select the name of the folder.